Once a modest suburban church, St. Alban’s Church in Romford, Essex, England, has been transformed in the last two decades into a place of artistic beauty and excellence, a centre for significant works of ecclesiastical art. The Reverend Father Roderick S. P. Hingley, the genial giant of a parish priest who led this transformation, believes the visual arts are “a great vehicle for communicating the Christian Gospel.” We are living through an exciting period in ecclesiastical art, he says, and therefore churches ought to be bold, creative, and adventurous in the commissioning of original art. Fr. Hingley’s work at St. Alban’s began with a major decluttering of the overfurnished church interior from 1992 to 1995. This was the first step in making way for more than twenty separate commissions, the most significant of which are fifteen Stations of the Cross by Charles Gurrey, a Christus Rex by Peter Eugene Ball, seven stained glass windows by Patrick Reyntiens, and a chancel ceiling mural by Mark Cazalet. These and others have garnered the church twenty-one Design Awards from the Chelmsford Diocesan Advisory Committee. Gurrey’s Stations are carved in European oak, their irregular sizes governed by each individual design. They speak with an eloquent minimalism, each piece focusing on a detail from the station and stimulating the viewer’s imagination to picture the fuller scene. Christ’s face remains unseen until the final resurrection station. 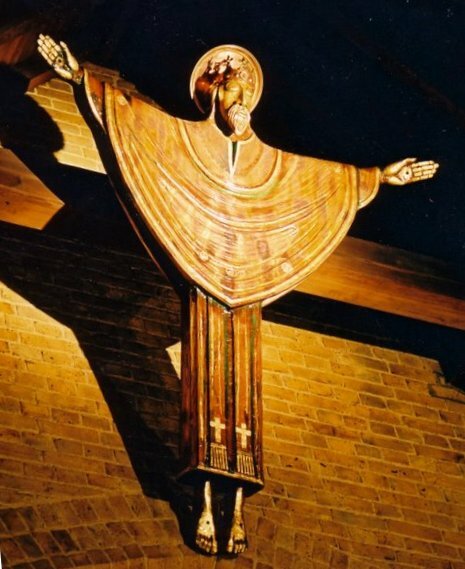 The Christus Rex at St. Alban’s is the first that Ball carved of Christ as the supreme and eternal high priest. This Christ, gilded with red and gold and clothed with a chasuble and stole, springs forth from the brick wall to embrace and bless the congregation below. Cazalet, on first coming into St. Alban’s, was struck by the visual link between this golden Christ and the rich colors of Reyntiens’s stained glass below. Reyntiens helped redefine the medium of stained glass through his collaborations with John Piper. Among their numerous ecclesiastical and secular commissions in Britain and the United States were the iconic baptistery window at Coventry Cathedral and their “Crown of Glass” at Liverpool Metropolitan Cathedral. On his own Reyntiens has also made windows for such churches as the National Cathedral in Washington, DC, and Southwell Minster in Nottinghamshire, and his work has been an inspiration to contemporary glass art workers. It was his windows at Southwell Minister—as here, filled with angels—that encouraged Fr. Hingley to approach him regarding work at St. Alban’s. At St. Alban’s five windows with angels fill the sanctuary with light and movement, their colours washing over the stone altar and steps. The three central angels hold, respectively, the crucifix, the host, and the chalice. The north and south windows are less dense in colour to allow for a greater play of light on the altar; they echo each other in their interplay of rose and fire imagery combined with the words of Julian of Norwich and T.S. Eliot. In his mural for the chancel ceiling, Cazalet linked the angel windows with the Christus Rex by depicting the angels of the four elements of creation: air, fire, earth, and water. Mirroring the church’s transition from the variegated blues of the baptistery window to the light-filled sanctuary, Cazalet’s mural moves from the dark blue of the winter night to the light and yellows of the summer sun. The light touch of this work extends to Cazalet’s humorous angels soaring above and engaging with the sights and sounds of Romford, including its commuters, shoppers, clubbers, and parishioners. Fr. Hingley is significantly involved in the schools of the parish of St. Alban, and groups of schoolchildren often visit the church. Many of the commissions at St. Alban’s have been made with children in mind, including Cazalet’s mural. Fr. Hingley’s community links have been a major source of support in raising funds for the church’s art. In addition to the support of the schools, funds have also been raised by church members and local businesses (Fr. Hingley has been chaplain to the local chamber of commerce) and through bequests and grants (including a major award from the Jerusalem Trust for the Cazalet mural). St. Alban’s art commissions have given the parish a “beyond-the-parish” ministry in that other parishes considering commissions of their own are regularly recommended to visit St. Alban’s in order to see what has been achieved, to be inspired, to gain ideas, and to be put in touch with artists. Visits also come as a result of the parish participating in borough-based open houses and art trail events. As chairman of governors and link governor for art and design at the Frances Bardsley School for Girls, the indefatigable Fr. Hingley has also played a significant role in the development of the school as a centre of excellence for the arts, as evidenced by its Brentwood Road Gallery and commissions at the school by Reyntiens and Cazalet. This engagement, which has led to Frances Bardsley joining the Chelmsford Diocesan Board of Education’s Affiliated Schools scheme, enables the school, parish, and diocese to “support each other in the spirit of Christian fellowship and service,” finding “innovative ways of working together and learning from one another.” One outcome is the inclusion of artworks by students, which will feature in the church as part of its forthcoming “Fan the Flame” mission week. a focus on people coming together for a shared activity. For all the positive aspects of St. Alban’s arts scheme and strategy, however, aspects of its commissions can be critiqued. For example, Gurrey’s Stations are insufficiently differentiated from the brickwork of the building and are therefore difficult to read from a distance. Moreover, the imagery used can at times seem esoteric (as with Cazalet’s ceiling) and is generally very Catholic in conception, requiring those less familiar with Catholic ritual to either brush up on it before visiting or find some images opaque. On another note, the colour choices of Reyntiens’s east windows—greens, reds, and browns—seem less than inspired for an artist who collaborated for many years with that great colourist John Piper. Finally, Cazalet’s mural struggles to image its theme, the four angels of creation appearing rather clumsily cartoonlike. The most successful elements of the composition—its side panels—are those that are least easily viewed. These, though, are minor criticisms, especially when considered in light of the overall design, strategy, process, and missional impact of this church interior. A vibrant transformation has been achieved in which a rather dull traditional church building has been made to sing by becoming a treasure house filled with high-quality and varied works of art. It is Fr. Hingley’s vision, together with the advice and input of the church architect, Nicholas J. Rank, that wrought this transformation. Most churches that have such significant commissions have accumulated their holdings over many years and through the ministry of many priests. It is a rare and special achievement to reorder and refit an entire church within the ministry of one parish priest and to do so with such a degree of attention to both quality and mission. What is most impressive is not the number and quality of the individual commissions, important as these are, but Fr. Hingley’s ability to create links of colour, shape, texture, and symbol that enhance worship and please aesthetically.